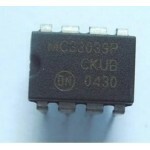 Buy online MC33035 SMD Brushless DC Motor Controller in India at low price from DNA Technology, Nashik. MC33035 is a high performance second generation monolithic brushless DC motor controller containing all of the active functions required to implement a full featured open loop, three or four phase motor control system. This device consists of a rotor position decoder for proper commutation sequencing, temperature compensated reference capable of supplying sensor power, frequency programmable sawtooth oscillator, three open collector top drivers, and three high current totem pole bottom drivers ideally suited for driving power MOSFETs. Also included are protective features consisting of undervoltage lockout, cycle−by−cycle current limiting with a selectable time delayed latched shutdown mode, internal thermal shutdown, and a unique fault output that can be interfaced into microprocessor controlled systems. Typical motor control functions include open loop speed, forward or reverse direction, run enable, and dynamic braking. The MC33035 is designed to operate with electrical sensor phasings of 60°/300° or 120°/240°, and can also efficiently control brush DC motors. 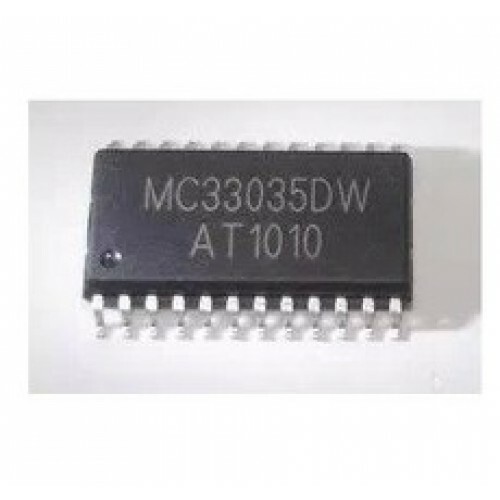 MC33035 Brushless DC Motor ControllerThe MC33035 is a high performance second generation monolithic ..
MC33039 Closed Loop Brushless Motor AdapterThe MC33039 is a high performance closed−loop speed contr..